When weight loss is your goal, the last thing you want are products full of extra calories, fat, and fake ingredients. 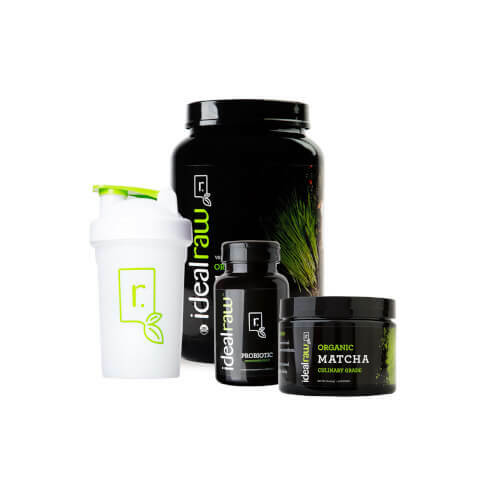 IdealRaw Protein gives you only what you need to support weight loss and fuel your body. Rev your metabolism with our Organic Matcha green tea powder, nature's best energy booster. A healthy gut is critical for weight loss, so give your gut some love with IdealRaw Probiotic. Please check the stock availability notice on your item when placing your order. This item is: Stock will be despatched to you as soon as we receive it from our supplier. I absolutely love this bundle. I got it as a gift and will buy it again for myself. The vanilla protein shake is to die for, its the best tasting vanilla protein powder I've ever had. The matcha green tea definitely helps out and gives me just enough of an energy booster to get through the longer work days. Finally, the IdealRaw Probiotic is a miracle worker. I have intestinal issues and always tend to be bloated just due to eating, and this supplement has really helped with that. (The Shaker bottle and $10 gift card were both SUPER BONUSES!!) You will not regret getting this bundle. I'M NOW A IDEALRAW SUPPORTER FOR LIFE!!!!!! !